One weekend after torrential rains pounded Tennessee, causing severe flooding and $1.5 billion in damage, United Methodists rolled up their sleeves and went to work. Crys Zinkiewicz of West Nashville United Methodist Church helped remove appliances and drywall from a flooded home on May 7. West Nashville Church and several congregations in the hard-hit Antioch area serve as distribution centers for food, water, diapers and other items. They also are gathering points for volunteers to go out to the community. In Bellevue, one of the most affected Nashville communities, the Rev. Debi Tyree, minister of music ministries at Bellevue United Methodist Church, put a notice last week about a “service of comfort” on her Facebook page. Northeast of Nashville, members of Grace United Methodist Church, Mount Juliet, were approached by Connell Memorial United Methodist Church, Goodlettsville, to help Dale Felton, who lost his home and his farm in the floods. “Grace has — so far — fixed his pasture fences so he can get his horses back out of the barns,” leader Ricardo Rios said. “We have provided him with a trailer to live in (temporarily); helped him salvage tools and personal items; cleaned out drywall, insulation and nails; and provided food. home in Nashville. A UMNS photo by Brennen Shearer. Bishop Richard J. Wills Jr., who experienced the devastation of Hurricane Andrew in 1992, said he was “inspired by the thousands who are busy at work in the flood-disaster response. In Centerville, Tenn., the Rev. William Burchfield, Columbia District Superintendent, called on his congregations to help with flood relief supplies. As recently as May 7, only two difficult routes into the area were open and passable. “There are people living in tents and in their cars,” Brock reported. “Local churches are preparing meals and giving out food and other items, but even the local store shelves are becoming empty. Indiana Annual (regional) Conference United Methodists were among those stepping up to the plate. 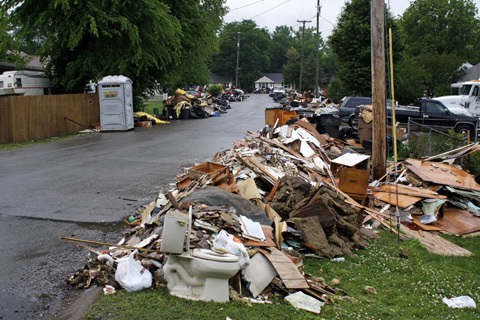 An emergency response team from the conference’s Southwest District arrived in Nashville May 9. “It was the first team on site for UMCOR work teams in Nashville,” Hoosier United Methodists Together Editor Daniel R. Gangler said. Another team arrived May 11. West Nashville home. A UMNS photo by Ronny Perry. Holston Annual (regional) Conference sent teams May 6 and 9 to respond to floods in Carthage, sending Early Response Teams May 6 and May 9. Another team will depart May 13. Mark Wills, a Greeneville pastor and Vanderbilt seminarian, joined with another student to collect $2,000 to buy 100 sleeping bags for immigrant children in a housing project that had not yet received assistance. "It's mind-boggling how many people are involved in this," he said. 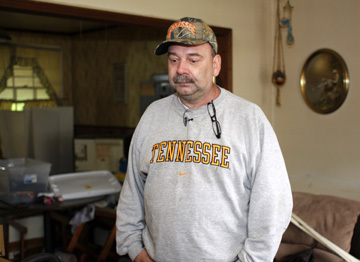 A day spent counseling victims for Hands on Nashville was "harder than anything else," he said. "To look into their eyes and see the pain of people who have lost everything was bittersweet," he said. When Wills returned to Greeneville to preach on Sunday morning, his two congregations loaded his car with canned foods and other supplies for flood victims. They also gave $800 to help buy the sleeping bags, Wills said. The two churches have about 35 members combined. In the Memphis Conference, flood relief was in full swing. For a full report and photos, please go to http://www.memphis-umc.org/reporter/2010/20100514 web.pdf.